Kids, Chores & Pets- Who is Responsible? Children who do chores at home do better in school. They do better in sports and other extra-curricular activities. The house gets fairly clean and organized and the whole family has more time to do things together. Our goal is to teach responsiblity but….. who is in charge of the pet? But what happens when you throw kids, chores & pets together? Is it chaos, clutter or cooperation? Mom, Can We Get A Puppy? As new family dog owners, whether it is a puppy or a mature family dog, you will need to assign chores to members of your family relating to the care of your dog. Depending on their ages, your children will either experience caring for the dog fully, helping out with some chores, or see you do all the work of a new pet. What to Expect From Young Children? You cannot expect very young children or toddlers to do complicated or dangerous chores. However, everyone can do something, even the young children. Probably, it will be best if the preschoolers get to help you, rather than try things for themselves. You can model how to care for a pet and then ask them to do a part under your supervision. Young children can help you walk your pet and help you groom the dog. If you are totally sure about the dog’s temperament, then young children can feed them, but they need to be taught to never tease a pet while they are eating. What to Expect From Tweens & Teens? Adolescent kids can fill any holes dug in the yard, and clean the kennel, bed or family dog run. Bedding will need to be changed and washed regularly as they become soiled. Food bowls must be cleaned, along with water bowls needing to be kept topped up with fresh water daily. Dogs do not need to be bathed very often. However, if they get very dirty, they should need a bath. Teens and even younger ones can get involved with bathing, with supervision. Bathing the family dog is fun, but messy. Be prepared with numerous towels, and give the chore of tidying up the bathroom afterwards to one of the kids. 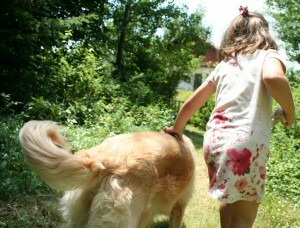 Cleaning up the droppings and family dog mess in the yard can be performed by older children, from age eight to sixteen. Feces can be dangerous if handled or ingested by young children, so be very vigilant if there is a cat and a sandbox for your kids. While pet poop patrol is not the best part of owning a pet, it is important that kids realize that it is a necessary part to the fun of having a pet. Gloves and spades should be provided to do the cleaning in a safe way. Always bag the poop in a bag and deposit it in the garbage. This part of having a pet is a great way to teach responsibility and kindness towards others. When the pet is walked, take along small bags, pick up poop and discard it correctly. Either way, they should learn that we must be responsible for the care of our pets. All too often the children promise you that they will care for and walk the dog if you agree to get one, but very quickly the novelty wears off and no one in the family wants to take on the burden of cleaning, feeding, walking, or grooming the dog – but they are absolutely essential for your pets health and safety. Draw up a weekly chores chart with sections for every day of the week, and who is responsible for what tasks. To learn how to teach and model a task in 4 easy parts, see www.kidschoresandmore.com This best-selling book also gives you a free ecourse on having a family meeting to discuss individual and family goals. You will be glad you got this.